My Jeep Cherokee is a black 1995 4.0 HO. It's so fast compared to other cars that I drive. I love it. I just love how mine sounds almost like it's pissed when you floor it, but the disadvantage is that I don't have a tach because it wasn't included in my Jeep. I can go form 0-60 mph in 7 secs. and 80 mph like 3 secs. later. It is a great truck and never gives up and I respect that. I raced a couple of trucks like Ford F-150's and Dodge Rams, and I beat them (keep in mind, mine is stock). Sometimes I feel as though my Jeep is different because other Cherokees that are the same seem a lot slower. I can also do a major burn out just by tapping fast on the gas pedal and it flies. Maybe the factory made this one faster by mistake, but I love it either way. 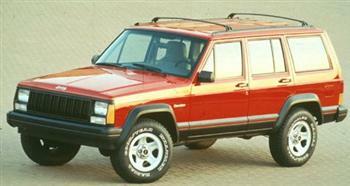 Larry's Comment: Glad to hear from another happy Cherokee XJ owner Patrick. Would like to see an actual photo of your black XJ though! You'll be interested to know that the HO (High Output) version of the engines sold were used in Jeeps for law enforcement as well. In Holly Springs, NC the police department has (had?) several of them. There was an article I read a few years ago when I had my '99 XJ that the 4.0L HO beat the BMW M series and gave the Z3 a good run for the money. Be proud of your HO. They are becoming more rare every year.